Algebra is about using pictures or letters to represent numbers. It is about stating a relationship between different numbers. For example, if N represents a number, then N + 9 is the number that is 9 greater than N.
So if N represents the number 3, then N + 9 is the number 12. If N represents the number 7, then N + 9 is the number 16. 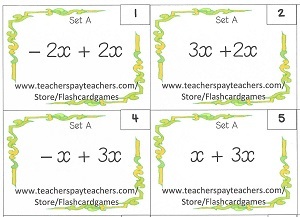 Here are 2 important terms for you to understand: Algebraic Expression and Algebraic Equation. In the previous example, N + 9 is called an algebraic expression because N can represent any number. If we write it this way: N + 9 = 12, we are writing an algebraic equation. In an equation, N represents a specific number, not any number. N + 9 = 12 means N is a number which, when added to 9, must give the answer 12. So N can only be the number 3 because only 3 + 9 is equal to 12. An algebraic expression tells us the relationship between numbers. An algebraic equation tells us a specific number that gives a specific result. Since the letters used in algebra are numbers, we can work with them in the same way that we work with numbers. This means that a number added to itself gives an answer that is twice of the number. It does not matter what number you chose for M, the result will still be twice of that number. Thus 2M means 2 groups of M.
2 groups of M can also mean 2 x M. Thus 2 x M = 2M is also true. Similarly, 5 x H = 5H, and so on. Just make sure that the letter used in algebra is the same. but R + T = 2RT is not true because R and T represents two different numbers. When working with Algebra and Numbers we have to work them out separately. Remember that the usual Rules of Operations apply when working with algebra. Try out these algebra questions.